In the process of creating a hand holding relationship with Neelam, I accrued the role of a mentor to myself for the first time. Being the youngest one in the family, I didn't have enough precedents from my own life to base my relationship on. To bridge this gap, Violet, Program coordinator and later Tanvi, Program coordinator held numerous training sessions and one-on-one meetings with the mentors. And that's when I realized that mentoring relationship was taking place at more than one level. SEWA Youth Connect envisioned bringing together young girls from two opposite spectrum of life. Dr. Sanjay Kumar Singh, Director, SEWA Bharat, put it very eloquently as "realizing one's social responsibility by giving back resources that we have enjoyed at the cost of those who have been denied yet come so far". Thus, the mentor-mentee relationship is that of equalizing besides empowering. Neelam, when I met her first, was a timid young girl, just out of school. She reminded so much of me when I had first come to Delhi. I was nervous and scared. I could sense similar emotions in Neelam. As my relationship with her grew, I realized she has not been encouraged to be independent. She had comfortably accepted the fact that she isn't a thinking being. A lot of it, I would blame on typical educational pedagogy in our country that taught Neelam how to take exams but not how to think. In my capacity, I tried pushing Neelam to think alternatively and creatively. I bombarded her with questions, which she found silly and then intriguing. The pieces that I asked her to write may not be very high-sounding yet it reflects her individuality and her own thinking. "Mentor-mentee ka rishta ek teacher ki tarah hona chahiye jisse padhai me help kar sake aur ek dost ki tarah hona chahiye jisse mai apni har baat share kar saku. Mujhe aaj tak aisi mentor nahi mili jinse mai apni baat share kar saku. Jo baat mai ghar me kisi se share nahi kar pati, wo mai apne mentor se kar sakti hoon. Jab mai youth connect se judi toh maine socha bhi nahi tha ki mujhe itni saari nayi baatein pata chalengi, naye logon se baat karungi. Ab mai akele aa ja sakti hoon. Mujhme confidence aa gaya hai. Jab mai apne mentor se milne jati hoon, wo mujhe alag alag jagah le jati hain aur batati hain ki yeh jagah bahut purani hai, jaise agrasen ki baoli. wo mujhse kehati hai ki jo na pata ho wo kisi se bhi pooch lo bina jhijhke. Meri metor ne mujhe vaishvikaran itne achche se padhya ki mujhe aaj bhi yaad hain. Meri mentor mujhe apne aas paas safe atmosphere banae ke liye bolti hai". I take immense pride when Neelam immediately rises up from her seat to order coffee for both of us on our weekly meetings, something she was hesitant doing initially. She has shown evident signs of overcoming her hesitation and fears. She's catching up with spoken English because she feels intimidated by the fact that other people can speak English fluently while she can't. I encourage and help her to learn English however I make sure that she doesn't base her self-worth entirely on these superficial attributes. 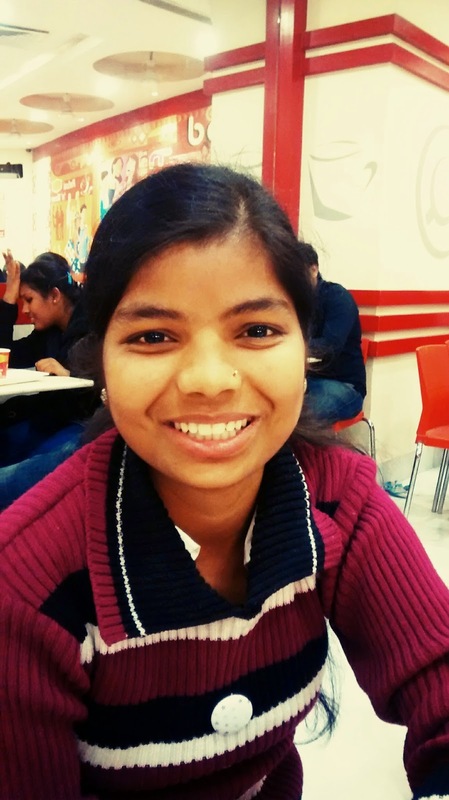 Six months ahead from when we had started, Neelam can now travel on her own. She laughs more often now. Most importantly, she is beginning to have an opinion on matters trivial or important. Neelam is growing. I am growing. Together, with SEWA, we are growing. This is truly inspiring. I wish we had more young girls like you. Keep up the good work.